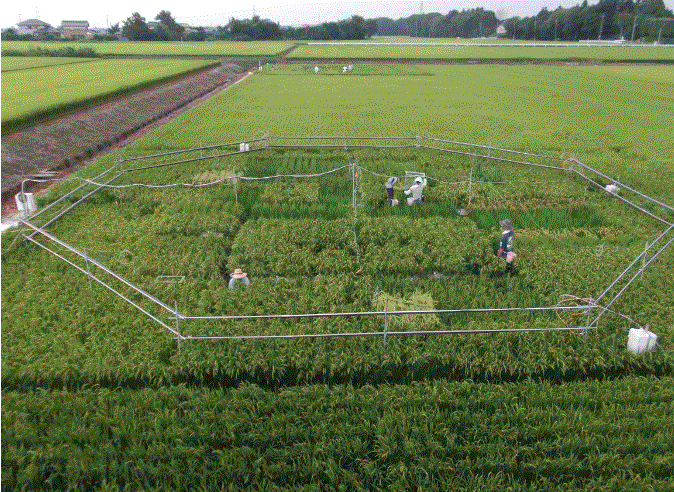 Rice within the octagon in this field is part of an experiment to grow rice under different levels of carbon dioxide. Plants need carbon dioxide to live. But its effects on them are complicated. As the level of carbon dioxide in the air continues to rise because of climate change, scientists are trying to pin down how the plants we eat are being impacted. Rows of controlled chambers that look kind of like industrial refrigerators are testing how plants react to different levels of CO2 at the U.S. Department of Agriculture’s Adaptive Cropping Systems Laboratory outside of Washington, D.C.
On a recent afternoon, Lewis Ziska, who’s a plant physiologist with the U.S. Department of Agriculture, demonstrates an experiment there with a crop important to many of us — coffee. The chamber is really bright to mimic the sun. A few neat rows of green coffee plants are growing. The air that they’re absorbing has about the same amount of CO2 as in the pre-industrial age, about 250 years ago. Across the hall, we can see a possible glimpse of the plant’s future. Here, there’s a chamber with plants growing at CO2 levels projected for the end of this century. “Some of the varieties, you ought to see that they’re bigger,” says Ziska. They’ve all been growing for the same amount of time, but the high CO2 coffee plants are larger. The extra CO2 seems to be making them grow faster. Scientists have noticed that in many kind of plants, higher CO2 produces bigger crops. That sounds like a good thing. But there’s a problem. Bigger doesn’t necessarily mean better. And while they’re still testing what this means for coffee’s quality, scientists have seen that other crops have lost some of their nutritional value under higher CO2 conditions. For example: rice, a primary food source for more than 2 billion people. Ziska recently teamed up with an international group of scientists to study whether high CO2 had an effect on the rice’s nutrition. “Was it changing not just how the plant grew, but the quality of the plant?” he asked. They tested how 18 different kinds of rice responded to CO2 levels that are projected by the end of the century, based on conservative estimates, Ziska says. The technique they used, called free-air CO2 enrichment, allowed them to grow the rice and add CO2 to the air immediately surrounding the plants using a big hoop in the middle of a field, Ziska explains. They did this over multiple years in facilities in Japan and China. And the effect was clear: Higher CO2 reduced multiple key measures of rice’s nutritional value. Across the different types of rice, they observed average decreases of 10 percent in protein, eight percent in iron and five percent in zinc. Four important B vitamins decreased between 13 and 30 percent. The research was recently published in Science Advances. Higher carbon dioxide is not just affecting rice. There’s evidence that the scope of this is much bigger. Harvard’s Sam Myers, who studies the impact of climate change on nutrition, has tested CO2‘s impact on the protein, iron and zinc of a number of staple crops using the same free-air CO2 enrichment technique. “Most of the food crops that we consume showed these nutrient reductions,” Myers says. The effects varied somewhat — he says wheat showed declines in protein, iron and zinc, and soybeans and field peas showed declines in iron and zinc. Maize and sorghum were less affected. These studies are enough to raise concerns about the impact on human health, he says. “Under what circumstances would this be a big problem?” Most likely, he says, it would be in situations where someone is “living relatively near a threshold of nutrient insufficiencies, so you’re just barely getting enough of that particular nutrient.” And secondly, it would more harmful when that person gets a meaningful amount of a nutrient from the crop that’s losing nutritional value. “There’s quite high global vulnerability to these effects, and we’re likely to see really significant health impacts from these nutrient changes,” he adds. At the same time, the exact health effects of this are still unclear, says Naomi Fukagawa, the director of the USDA’s Beltsville Human Nutrition Research Center, who was part of the team researching rice. She says it’s hard to know how a person’s health will be affected by changes to the nutritional quality of a specific food in a mixed diet. “We don’t quite have all the answers yet,” she says. Scientists also don’t understand what it is about higher CO2 that causes plants to become less nutritious, Ziska says, though they have some theories. However, Myers notes that if this were the cause, all of the nutrients would be decreasing at approximately the same rate. And that’s not necessarily the case. For example, with the recent rice study, most of the minerals and vitamins tested went down, but vitamin E went up. Another theory, Ziska says, is that the rising carbon dioxide levels change how water moves through the plant, which could also affect some of the nutrients.